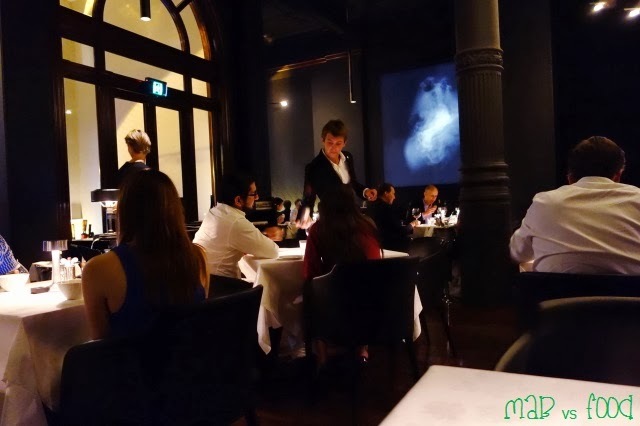 Today's entry is about my dinner recently at the relaunched Rockpool. 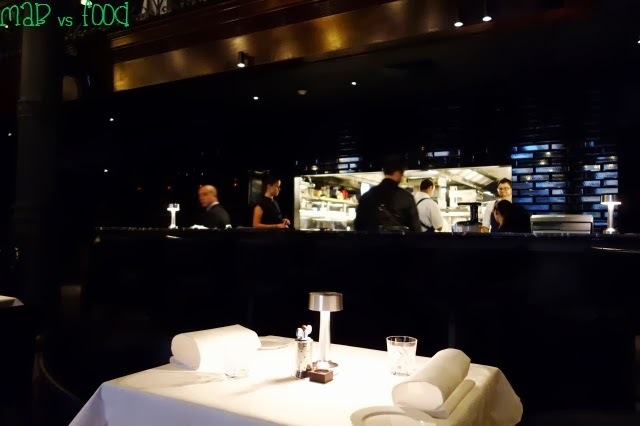 Rockpool is Neil Perry's flagship restaurant ans is a Sydney institution that has just turned 25 years old. 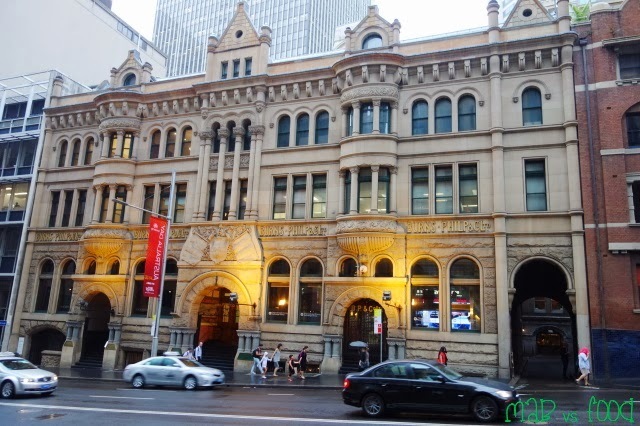 It has grown up now and has a new home in the heritage-listed Burns Philp and Co. building. After all these years of indulging, I am not sure why Rockpool is the only 3 hatted restaurant in Sydney that I have yet to eat at. Maybe it's because at Rockpool there's a gwai lo doing food influenced by Chinese cuisine (as well as other Asian cuisines). But if there is a white man that knows Chinese cuisine and how to run a successful restaurant, Neil Perry is your man! The dining room at the new Rockpool is a thing of beauty: a plush historical room with high ceilings, split levels, chandeliers emitting just enough light, white tablecloths offsetting the charcoal black walls, a bar area with a marble bench top, and an open kitchen. The room is really really dark too. 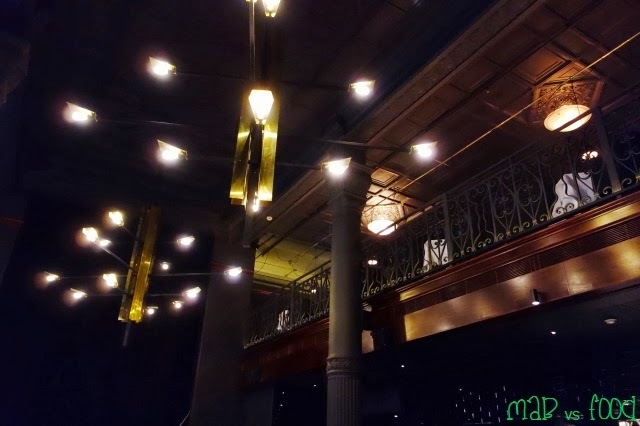 Rockpool must be in a competition with Spice Temple (another Neil Perry restaurant) for the most dimly lit restaurant in Sydney. Thank goodness for the movable lamp on each table. Otherwise I would not have been able to take any pictures (without the use of flash, which is a big no no) or even see what I was eating! The dinner menu (click on the photo for an enlarged version) is very different to anything else offered in Sydney. I was confused about how this menu worked when I looked at their website so needed the full rundown from the waiter. The meal starts off with 8 different snacks (or beginning the journey). 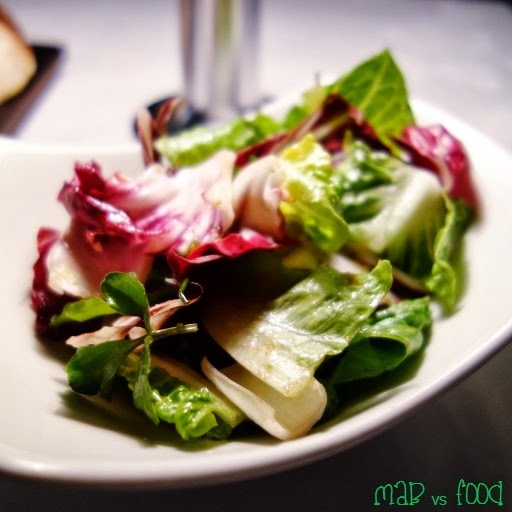 The journey then continues with either one choice ($125 total), two choices ($145) or three choices ($165) from an a la carte menu containing mains and desserts. So it's like having a tasting menu followed by courses from an a la carte menu. Rockpool also relaunched with a new lunch menu ($52 for one course, $69 for two courses and $79 for three courses). 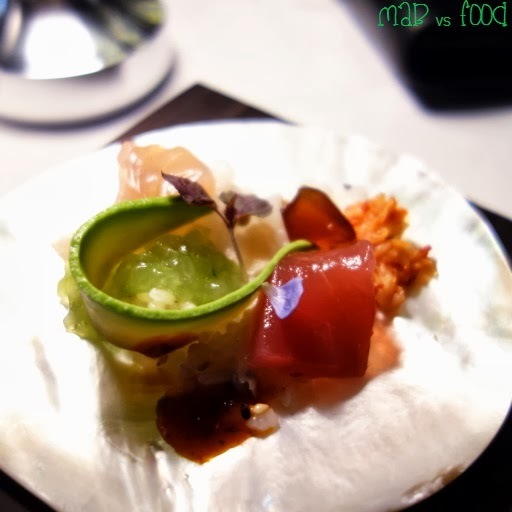 The food is very different to dinner and is worth checking out as it looks to good value for food in a three hat restaurant. I decided to go with three choices tonight. I went for 2 savoury options and one dessert, but you can pick any combination of sweet and savouries depending on your mood (you could go with 3 savoury choices or even 3 desserts if you're a sweet tooth). 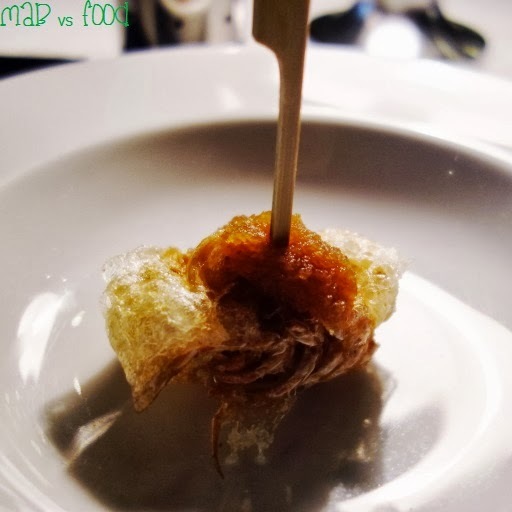 First up is a prawn head tempura. Prawn heads are the best part of a prawn - so much deliciousness within! I just love sucking out all their brain juices hehe. Here you eat them whole as the prawn head has been deep fried in a light, crispy batter and served with some grated daikon and soy. Not long after the prawn head a chicken wing that looks like a meaty lollypop is placed on the table. 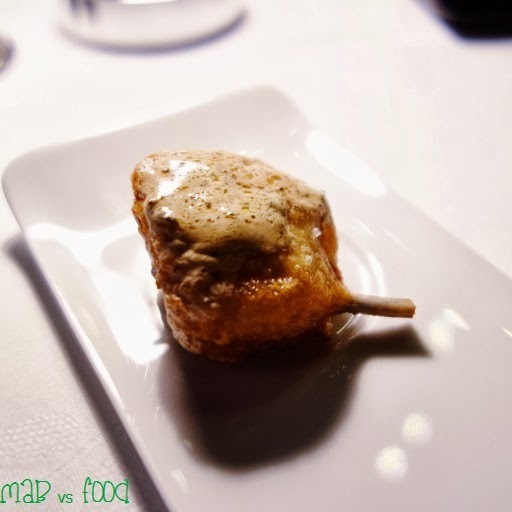 Within the crispy egg batter was some juicy and succulent chicken meat. The wing was drizzled with a konbu butter that was full of umami goodness. I would happily eat a plate of these if they were served as canapes at a dinner party. I love chawan mushi, that silky smooth Japanese egg custard. I really enjoyed the flavours of soy and dashi in the chawan mushi. 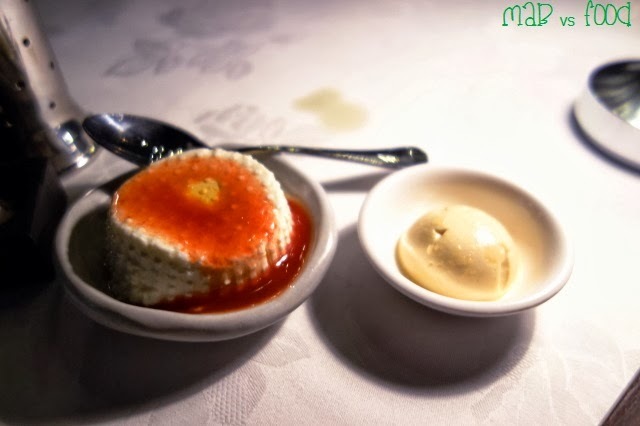 The egg custard was topped with some shreds of tender and delicate lobster and little globes of trout roe, which provided delicious bursts of flavour that go so well with the lobster and the custard. Rockpool's chirashi zushi is one of Rockpool's signature dishes over the years and this one is mini-sized version. 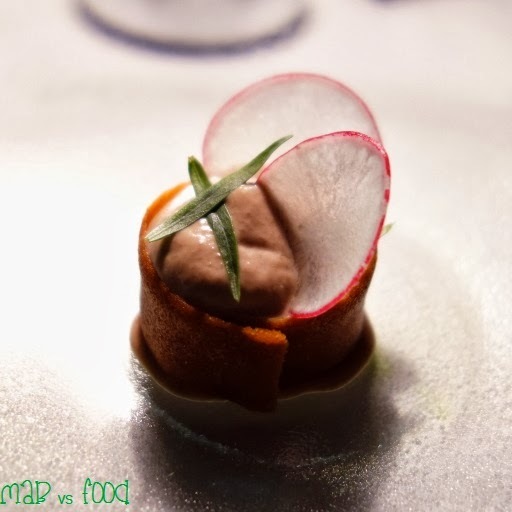 This was an amazing course that had some brilliant flavour combinations. The seafood was fresh and of exceptional quality. The tuna just melted in the mouth and the kingfish was slightly firm and had great flavour. There were chunks of raw squid mixed through the vinegared rice. The flavours from kimchi, chilli oil, and sesame oil were punchy and highly enjoyable. The snapper was gently steamed and cooked to perfection. The flesh was moist and not the least bit dry. 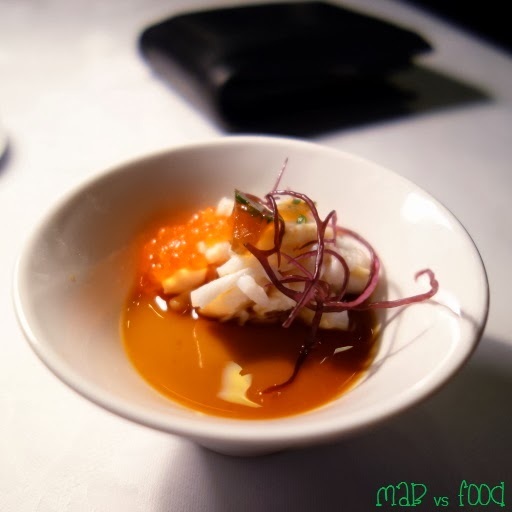 The snapper was glazed with a wonderful sauce made from lobster coral (lobster roe or egg sac) and miso. Much like prawn heads, I think lobster coral is pure gold - so much amazing rich flavour that goes brilliantly with the delicate snapper! Continuing on with the seafood journey, next up was snow crab. 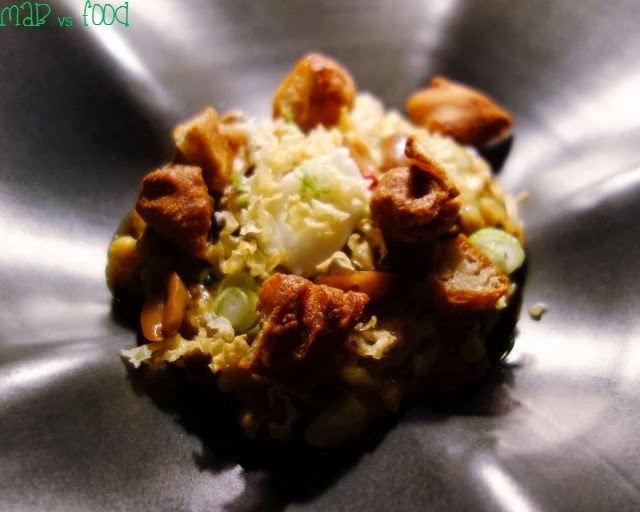 The sweet, delicate flakes of snow crab were paired with a quenelle of smooth, creamy potato sprinkled with prawn powder, rich and nutty freekeh, and XO sauce. Yum! Next was perhaps my favourite out of the snacks: duck parfait with plum jam. The duck parfait was rich, incredibly smooth and just addictive. It was very enjoyable with the thin and crispy tuile. One of the best parfaits I have ever had. And the tartness of the plum jam works as a brilliant offset to the richness of the parfait. 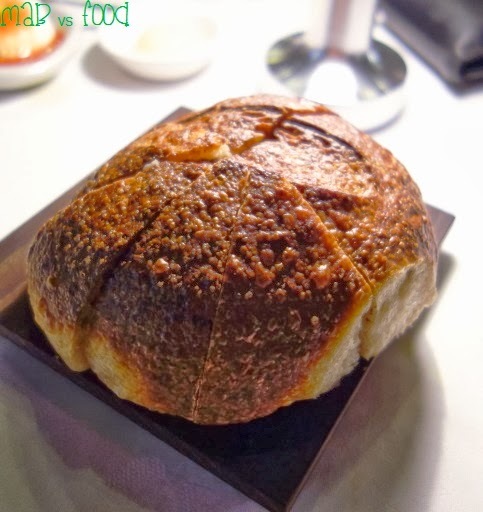 Before the a la carte choices came out, the waiter bring out a fresh, warm mini loaf of honey and spelt bread. This was a great bread, as expected at a three-hat restaurant: wonderfully crusty and robust in flavour. To be enjoyed with the bread was a fresh ricotta, which was made in house and served with tomato water and extra virgin olive oil, and a house churned butter. The butter was exceptional - creamy yet whipped til it was like a light, fluffy cloud. After a bit of a break, which was much welcomed after all those snacks and bread,the a la carte choices were brought to the table. Another Rockpool classic is their version of the Chinese favourite, congee. This is certainly not the bland, watery concoction that you sometimes find. The rich and noble Balmain bug congee is exactly that: piping hot, rich, creamy and extremely moreish. This congee packs a punch with loads of amazing flavour exploding in your mouth with each spoonful. The deliciousness of Balmain bug is found throughout the entire bowl with small chunks of Balmain bug flesh mixed in and the flavour of coral infused into the congee. Together with crispy yau ja gwai, chilli oil, creamy almond tofu, corn, shallots, star anise peanuts, shitake and enoki mushrooms, this congee is just impossible to resist. Dish of the day, enough said! Two cuts of wagyu beef are used in my final savoury course: a thick, chunky cheek and a very thin slice of sirloin. This was the most flavoursome, melt-in- your-mouth tender beef cheek! Obviously no knife was necessary to peel off each strand of meat from the cheek. The mustard and jus just added to the deliciousness. The sirloin was cooked rare and was also really tasty. This course also came with warm, gelatinous tendon and winter melon, one of my favourite melons that is commonly found in Chinese cooking. This winter melon had a bit of crunch and although I am more used to a softer texture, I still enjoy its sweet, mild flavour. 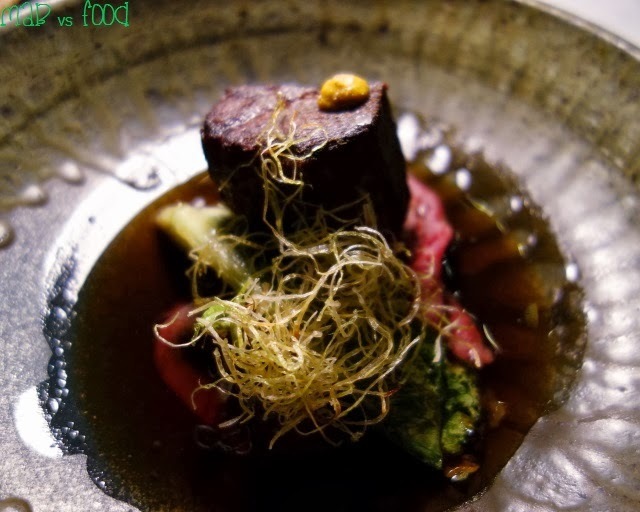 Overall, the beef sirloin and cheek is another knockout dish! 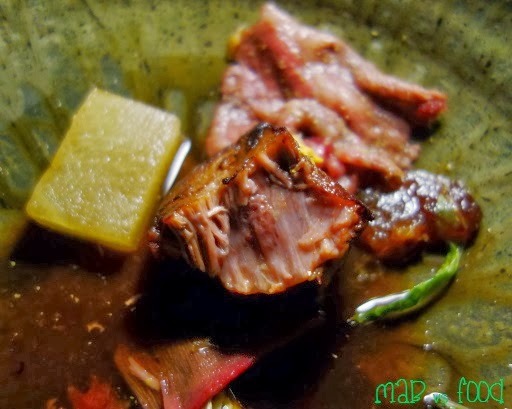 The meaty beef course came with a much needed side of salad with palm sugar vinaigrette. The salad was fresh and crisp but I found the palm sugar vinaigrette to be a bit sweet for a salad. I would have preferred more acidity. The pre-dessert was an interesting pairing of a fruit and a vegetable. 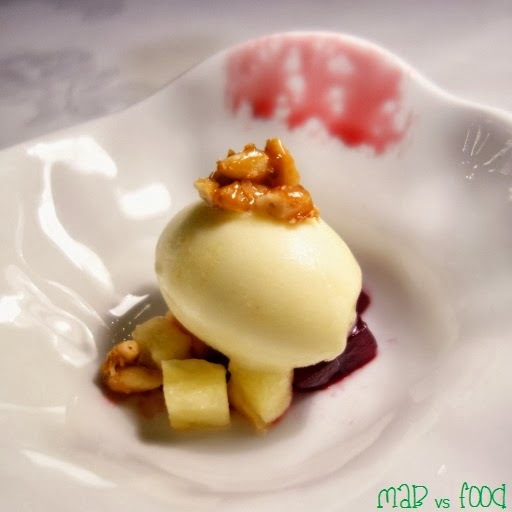 Pineapple was served 2 ways, as a sorbet and fresh. The sorbet was so amazing and refreshing. I'd be happy to eat this all day on a summer's day on the beach. Beetroot in a dessert may seem odd but beetroot is sweet too, so why not? Topping the sorbet was some candied pine nuts. I struggled with what to have for dessert, but my waiter recommended their signature dessert, Vacherin pandan custard with coconut parfait, jasmine sorbet and lime granita (Rockpool's interpretation of yum cha favourite mango pudding was also tempting, but it will have to wait another day). Not only was this just a gorgeous dessert to look at, the flavours were just spot on! It was refreshing, not too sweet, had great textures, and the flavours unexpectedly go so well together. The coconut parfait is smooth and just delicious. As was the custard made from vacherin cheese and pandan. The jasmine sorbet was smooth and had pleasant and subtle floral notes. 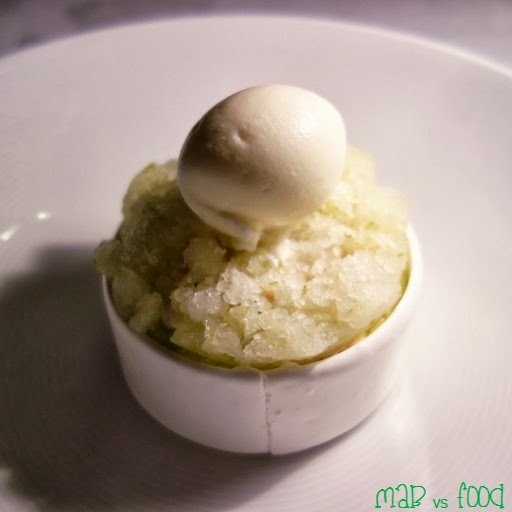 The lime granita and fresh lime were tangy and refreshing. 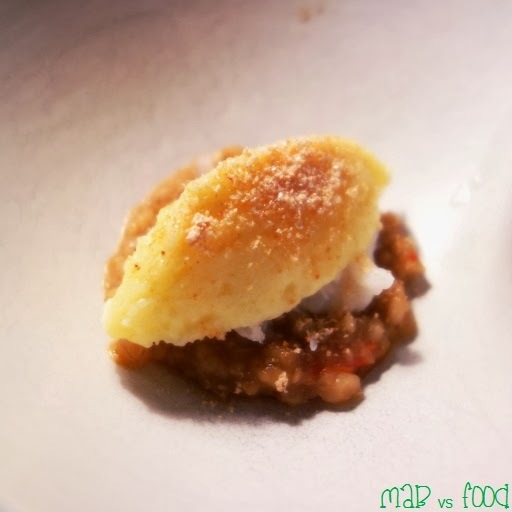 The crispy and not-too-eggy meringue came as a ring wrapped around the dessert and as pellets mixed amongst the granita. 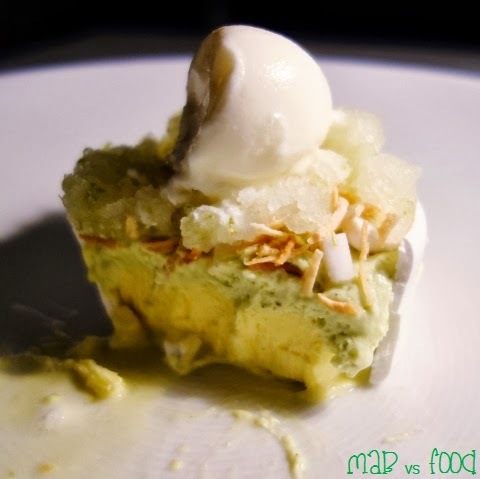 Somehow all these flavours and textures came together to produce an epic dessert! Of course you cannot leave Rockpool without having the famous date tart, which has been downsized and now served at the end of the meal. 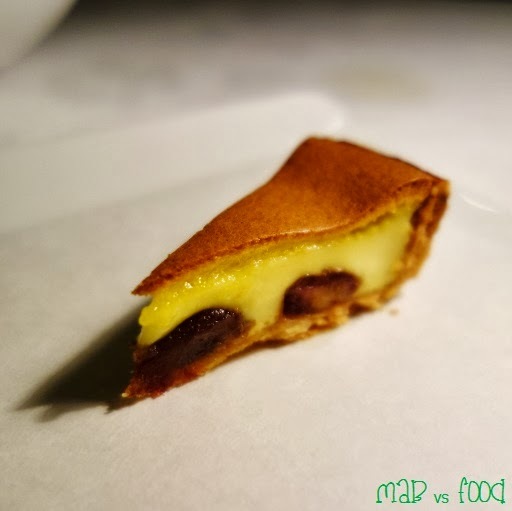 I cannot begin to describe how amazing this tart is: silky custard, sweet dates, thin layer of cake at the top and a buttery crust. Simplicity at its best! Only problem is, its gone before you know it. 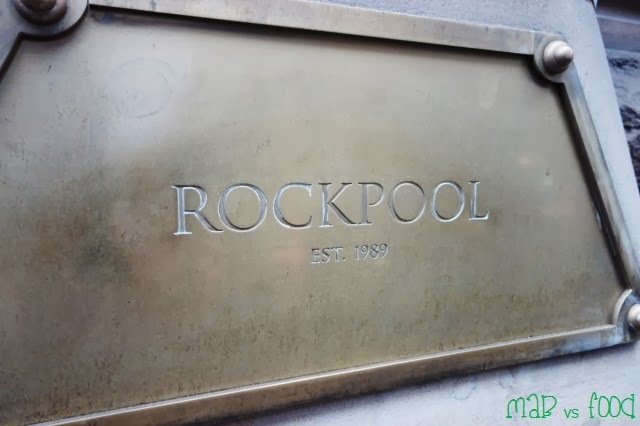 I never went to the original Rockpool but wow, the rebooted version of Rockpool is mighty fine! This was definitely my best meal since getting back from Europe! Rockpool successfully uses familiar Chinese flavours to create exciting, refined and contemporary food. This meal left me buzzing with excitement and I know I will be raving about this meal for months to come (like I am now!). 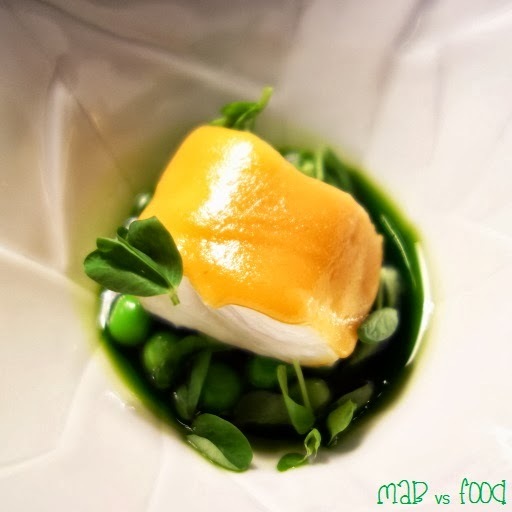 I can't wait to be back to try other dishes (the new lunch format looks awfully tempting!). Highlight: Wow, the entire meal was a highlight! But if I had to choose my favourite course, it would have to be the Balmain Bug congee. Lowlight: 3 choices in addition to all the snacks at the start is an incredible amount of food though!